Meandering thru the market this weekend, I was drawn to, okay admittedly alot of things but needing to find some focus, a pile of beautifully bundled greens with delicate curling tendrils. 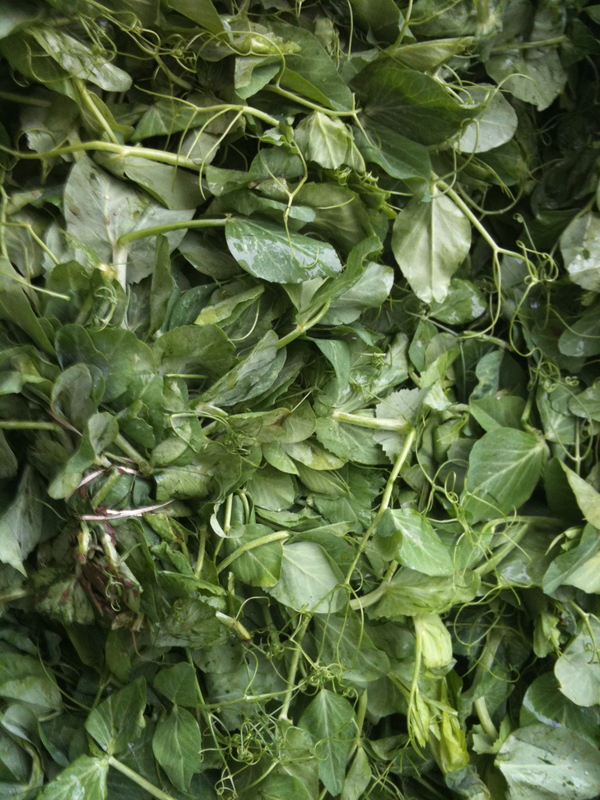 Ah, the precursor to peas (who yes I did see at the market for the first time this season) – pea tendrils. So fresh and green and shouting “Spring”, their time at the market is now, so stop eyeing the lovely mini tarts across the aisle and get back to choosing the perfect bunch of pea tendrils. 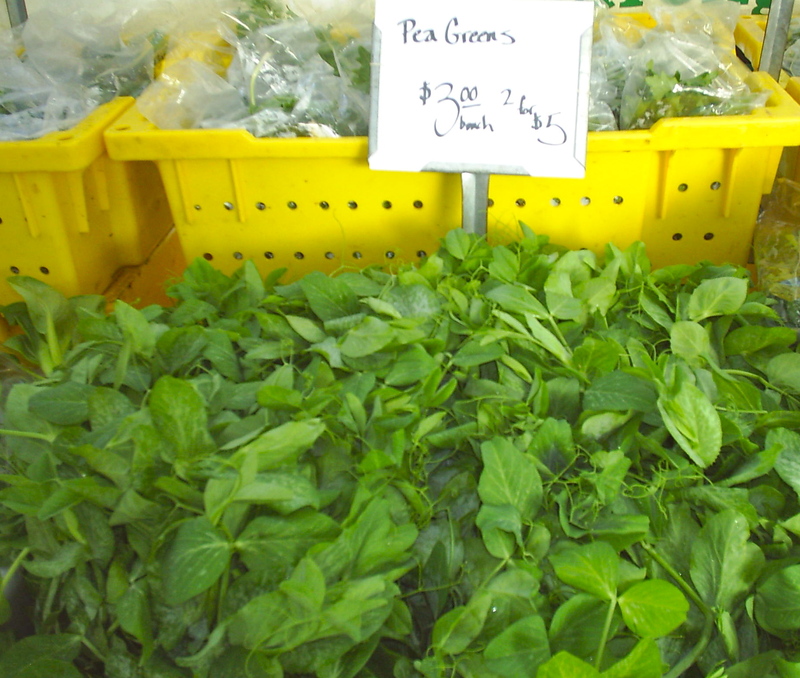 Pea tendrils are the shoots and leaves of the snow pea plant. A spring delicacy that has the subtle sweetness of the pea, but crisp. Look for tendrils that are young and tender. How can you tell they aren’t too mature? Hint: if they have flowers on them the tendrils and stems can be tough. If that is the case no worries, just remove the tougher stems and tendrils. Pea tendrils do not keep well (hence, sadly, not seeing them on too many restaurant menus) so if you pick a bunch up from the market I would advice preparing that day or at the latest the next. Trust me on this, it is heartbreaking to find the forgotten, withered bunch of pea tendrils at the bottom of the crisper drawer. And honestly preparation couldn’t be easier. Use pea tendrils as you would other greens: sauteed in butter, stir-fried, in soups, or raw, or in a salad with a light vinaigrette. A favorite in Chinese kitchens, where the pea tendril are referred to as dau miu, simply stir-fried in in hot oil and garlic until just wilted and ta da – done. Taking my own advice, for once, I got my market treasures home and, inspired to make a simple stir-fry, I bumped it up with a few more market finds. The following results in a great lunch, plain and served over white rice or a nice side for dinner. Trim stems of pea tendrils, mustards and broccoli rabe. I went with leaving the greens whole but you can give a rough chop if you like. Heat oil in large fry pan or wok until hot. 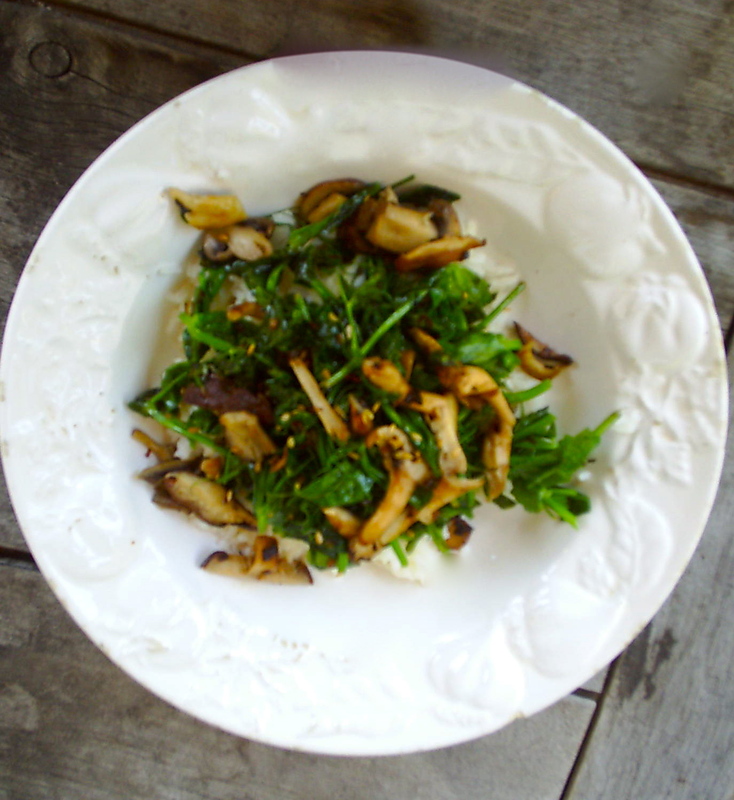 Add mushrooms and cook for approximately 1 minute. Add the oyster sauce to coat the mushrooms. Add green garlic and then immediately add all of the greens. Cook until just wilted. Finish with pinch of salt and a splash of dry sherry. Serve as side or over white rice. This entry was posted in Uncategorized and tagged Andersonville Farmers Market, broccoli rabe, Chicago Area farmers marekts, Chicago Farmer's Markets, Evanston Farmer's Market, Farmers Markets, fresh organic, fresh seasonal organic produce, Glenwood Sunday Market, Henry's Farm, moira's blog, mushrooms, mustard greens, Nichols Farm, pea tentrils, River Valley Mushrooms, snow peas, sugar snap peas, sustainable, to market with mo. Bookmark the permalink.